The Enerchip VitaCell Dog and VitaCell Cat is a revolutionary product in the field of health and wellness for dogs and cats. The health-promoting properties of the Enerchip VitaCell positively affect the stem cells of treated animals, support their well-being and health. The application of 4pets Enerchip VitaCell is very easy and convenient. Enerchip VitaCell is simply stuck into the water bowl and gives the effect out to the water during at least 6 months. The tedious and time-consuming administration of feed additives can thus be dispensed with. Whenever the cat or the dog drinks from the bowl containing the Enerchip VitaCell, the animal takes on the positive influence of the Enerchips via the water. The scientific evidence about the effects of Enerchip VitaCell were provided by investigating the influence of Enerchip VitaCell on dog and cat stem cells. Vet Cell Europe, the renowned stem cell laboratory of Switzerland, which is headed by a veterinarian, conducted the investigations under scientific conditions. The experimental setup used adult stem cells of 10 x 10 different dogs and 10 x 10 different cats. 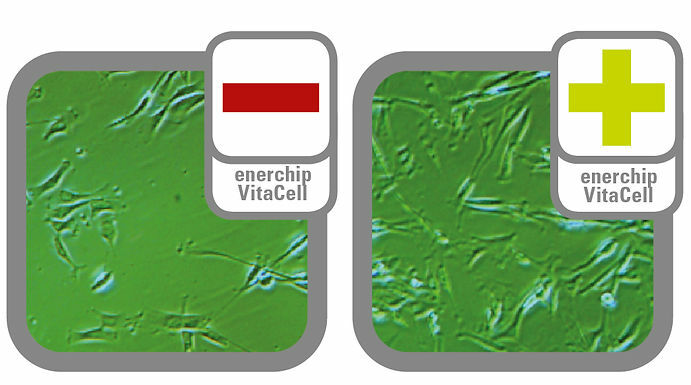 Under standard conditions cells were each bred with or without the influence of an Enerchip VitaCell during 48 hours and the cell number and thus the growth were compared with each other. All the cells came from donors, for which, on the occasion of the castration, a hazelnut-sized piece of adipose tissue of the subcutis or of the abdominal cavity was removed under normal surgical conditions. The removal took place using an anesthetic and was therefore completely pain-free for the animals. The patients were of different races, genders, and age. The extracted adipose tissue was further processed at Vet Cell Europe accordingly. After the isolation of the stem cells, they were stored in liquid nitrogen. The isolation procedures, storage of cells and the thawing process were the same for all animals. Around 500‘000 cells were thawed for all animals. The thawed cells were bred in a nutrient solution in an incubator at 37°C and 5 percent of CO2. To avoid a widely diffused influence of the Enerchips, 2 separate incubators were used. To have a direct comparison, 2 stem cell doses were thawed per animal. One was provided on the bottom of the bottle with the Enerchip VitaCell and the other one was transferred without Enerchip into an identical culture flask. The number of cells per dose amounted to approximately 500‘000 cells. The cells were observed over a period of 48 hours on a regular basis with the inverted microscope and photographically recorded. After 48 hours, the cell number was measured and compared each within the respective animal. The cells were measured with an automated cell counting device of the company Biorad. The increase in the stem cell proliferation due to the influence of the Enerchips was very clear and pronounced. For dog stem cells, an average growth of 26.2 percent was found in the group in which the Enerchip VitaCell dog was used. An average growth increase to 35.92 percent was observed for the cats under the influence of the Enerchip VitaCell cat. Has been installed for 1 week and I have noticed that a big red spot that had been on my dog's belly for several months is gone since this morning. I will order one for my outdoor cats as soon as I find out if it will stick to a heated water bowl.